LAWRENCE — A University of Kansas alumnus will be the new leader of an office designed to support and strengthen KU's faculty. J. Christopher Brown, a jointly appointed professor in the Department of Geography and Atmospheric Science and the Environmental Studies Program, has been selected to be the new vice provost for Faculty Development. Brown, who also directs the Environmental Studies Program, will begin his responsibilities in July. The vice provost for faculty development provides guidance and oversight for faculty recruitment and develops and implements programs that foster professional growth of faculty at all levels of their careers. The vice provost also works with deans, university governance and other vice provosts to review and recommend changes to personnel and evaluation policies. The directors of the Center for Teaching Excellence and KU’s ROTC programs all report to the vice provost. Brown joined KU in 2001. He was named director of the Environmental Studies Program in 2008 and promoted to professor in 2015. Before joining KU, Brown was a lecturer at both the University of California, Los Angeles and Santa Monica College. His research interests cover a vast spectrum and include the political and ecological dynamics of development and conservation, political ecology, land-change science, biogeography, development institutions and policy, and nongovernmental organizations. His regional expertise is in Latin America, especially the Brazilian Amazon. He is a prolific author with nine book chapters, 34 journal articles, and more than 50 conference proceedings and presentations to his credit. He has been a reviewer for two dozen journals spanning the natural sciences, social sciences and humanities. Brown has been an active participant in university activities, having served on search committees, the University Sustainability Advisory Board, the University Strategic Planning Steering Committee and the Kansas NSF-EPSCoR management team. He has been a faculty mentor and host for visiting Fulbright Scholars and more recently has served on the Office of International Programs Campus Fulbright Committee. Within the College of Liberal Arts & Sciences, he’s served on numerous administrative and search committees. Brown has received several KU honors including the George and Eleanor Woodyard International Educator Award in 2016, the John C. Wright Graduate Mentor Award in 2008, and the Kemper Fellowship for Teaching Excellence in 2006. 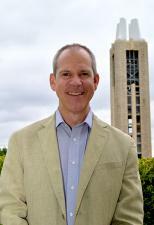 He was named a Center for Teaching Excellence Faculty Fellow in 2003. At UCLA he was co-winner of the Dissertation Year Fellowship and a Fulbright Fellowship. Brown earned a doctorate in geography from the UCLA and a master’s in Latin American studies and a bachelor’s in biology, both from the KU. He replaces Mary Lee Hummert, who in February announced the decision to return to her faculty role in the Department of Communication Studies in the fall. She plans to continue research into communications and aging.